Many IT jobs assessments include a syntax checking aptitude test. Learn what this test is all about and how JobTestPrep can help you prepare for it. Quite naturally, Syntax Checking tests are constituents of information technology candidate assessments. Alongside other important tests, syntax checking aptitude measures a critical skill in a computer-driven world: the ability to understand basic functions of any computer language, which is key for a multitude of job positions. 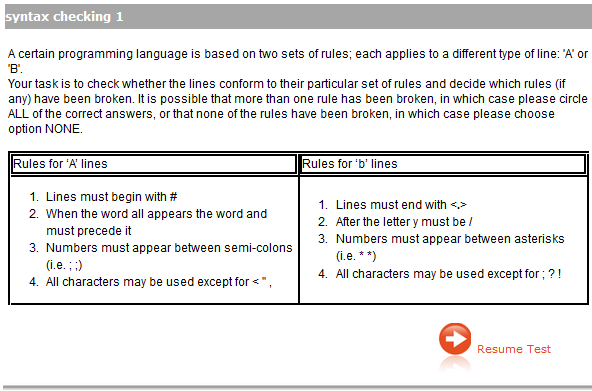 In Syntax Checking tests, candidates are provided with a mock computer language which consists of certain rules that are expressed through symbols, letters and numbers (much like any computer language). Candidates are then asked to inspect written lines of this language and make judgements whether the code makes sense or is invalid according to the language's rules. In a way, it's a bit like fixing grammar and typos in common writing, only in this case, rules are made up and require attention and fast response times. Jobs that involve coding, programming or software checking are likely to include this assessment, e.g. Systems Consultant, Systems Advisor, Integration Consultant, Administration Advisor, Client Technical Support Associate and more. The entire range of assessments IT candidates are likely to face is included in our IT aptitude tests practice pack! If you are looking for syntax-related tests as part of IBM's assessment, please refer to our IPAT practice pack.